My husband's reaction to this burger perfectly sums up how good it is. He held the burger in his hands, looked directly at it and said, "I love you burger." Do you see why I cook for him all the time? Instant gratification. 1. Preheat the broiler. Heat a large nonstick skillet over medium-high heat, then add the bacon and a drizzle of EVOO and cook until the bacon is crisp, 4 to 5 minutes. Transfer the bacon to a paper towelÂlined plate and drain off all but 1 tablespoon of the fat from the skillet. Return the skillet to medium-low heat and sweat the finely chopped onion in the bacon fat for 2 to 3 minutes. Combine the onion with the reserved bacon in a small bowl and let cool. Turn off the heat and set the skillet aside. 2. [I skipped ahead to step number three and made the burgers first, then did this step while the burgers were cooking.] In a medium nonstick skillet [I just used the same skilled that I cooked the finely chopped onions in, why clean two? ], heat 2 tablespoons of the EVOO, 2 turns of the pan, over medium heat. When the olive oil is hot, add the thinly sliced onions and cover them with a lid that fits inside the skillet. Cook until browned, 10 minutes, stirring occasionally. 3. While the onions are cooking, place the sirloin in a large bowl and top with the Worcestershire sauce, hot sauce and grill seasoning. Stir in the cooled chopped onions and bacon until evenly combined. Divide the meat into 4 even sections and form 4 large patties. Add the remaining 1 tablespoon of EVOO, 1 turn of the pan, to the large skillet and [I cooked mine on the grill instead, so I just drizzled some EVOO on the patties themselves] heat over medium-high heat. Add the burgers and cook for 4 minutes on each side for medium-rare and 6 minutes on each side for medium-well. 4. Toast the split rolls under the hot broiler until golden. Place the patties on the bun bottoms and top with the smoked Gouda. Remove the bun tops from the broiler pan. Return the burgers to the broiler to melt the cheese, about 30 seconds. Stir the steak sauce into the smothered onions. [I just toasted the buns and melted the cheese while the burgers were on the grill.] 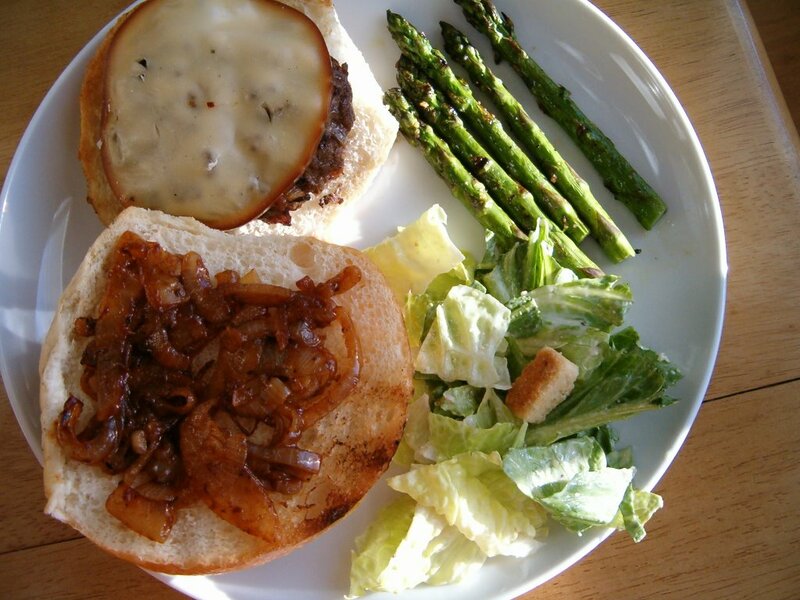 Top the burgers with the onions and set the bun tops in place. Transfer to plates and serve.